Sitting in a coffee shop the other day I noticed on the wall newspaper articles letting us all know that this was the place where J K Rowling gave birth to Harry Potter. She would come, sit in a window overlooking the castle, and...well the rest is history. The Elephant House is just one of the many places with literary links in Edinburgh. The pub, The Conan Doyle occupies the house that the very man lived in while he was in Edinburgh--there's a statue of his creation, Sherlock Holmes, standing across the road now trying not to be seen looking through the windows of pub, nonchalant in his cape and trademark deerstalker. In the New Town the other day, while sitting in the window of Starbucks, I saw Ian Rankin of Rebus fame crossing George Street perhaps on his way to the Oxford Bar and not long ago, my favourite writer of the moment, Alexander McCall Smith, was standing on the kerb in Charlotte Square his tropical jacket flying in the wind and his panama hat held in place. He looked deep in thought and was maybe going over in his mind another gentle tale about Mma Ramotswe far away in Botswana for her No 1 Ladies' Detective Agency to solve. Well, Kayoko isn't a write but, for me at least, she is much more approachable than any of these great writers. Here she is sitting in our newly finished living room. I ought to say we have finished our bathroom as well but maybe Kayoko will write about that in her blog. 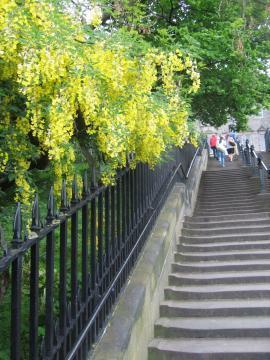 Oh, and this laburnum is how I want mine to look next year....it's on the steps up the Mound to the Writers' Museum; the life and writings of Walter Scott, Robert Louis Stephenson and plenty of others who are now dead are to be found here. More than any other city in Britain, Edinburgh loves its writers and its a thrill to be amongst them on a daily basis.